Visiting Spain I could not miss opportunity to get acquainted with the Spanish kitchen knives. 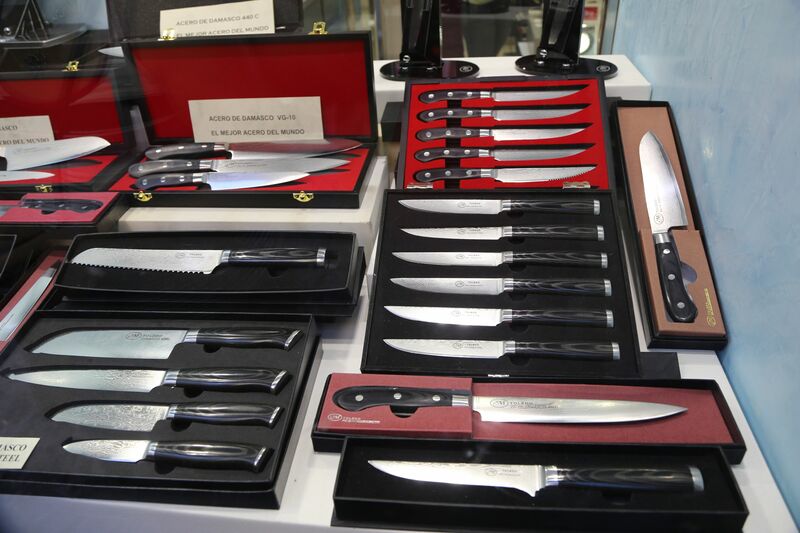 Spain is the home of Arcos, one of the oldest European knife manufacturers. Toledo has been know for centuries for its steel, swords and artisans. Almost every historic novel I read in my childhood featured a rapier or a sword “made from the finest Toledo steel”. Well, I started from Madrid’s Cuchillerías Simón, a specialized knife shop in the very center of Madrid, 100 meters from Metro Sevilla. A very professional shop attendant has recommended me the local brand (probably shop’s private label) Simon of Spain, a line of typical Sabatier forged knives similar by composition to quality German knives, with price range from 55 euro for 3.5 inch paring knife to 120 euro for 8 inch chef knife. Prices for similar stamped knifes were about 40% lower. Priced as Wusthof classic line the Simon brand failed to impress me beyond being decent ordinary European kitchen knives. For all my curiosity I was not ready to pay premium price for rather generic knives. Next day – Toledo. 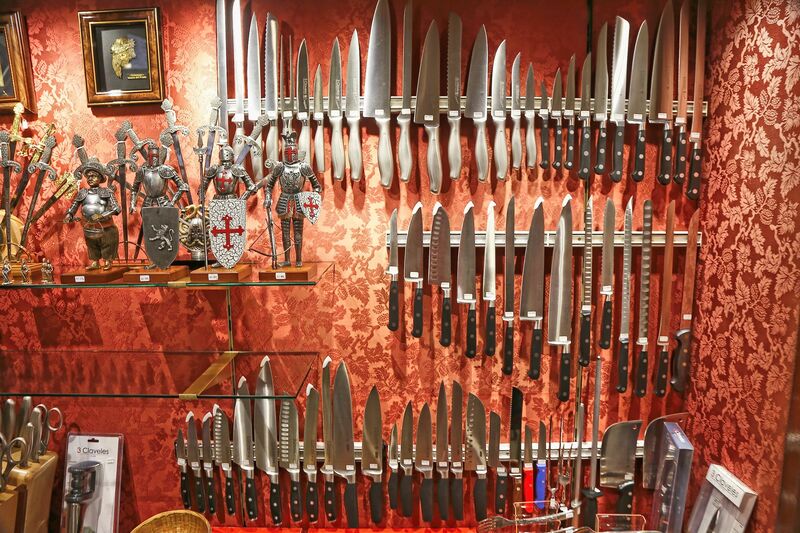 Every souvenir shop in Toledo offers kitchen knives next to all kinds of medieval armory, supposedly handcrafted by the last surviving artisan of Toledo. 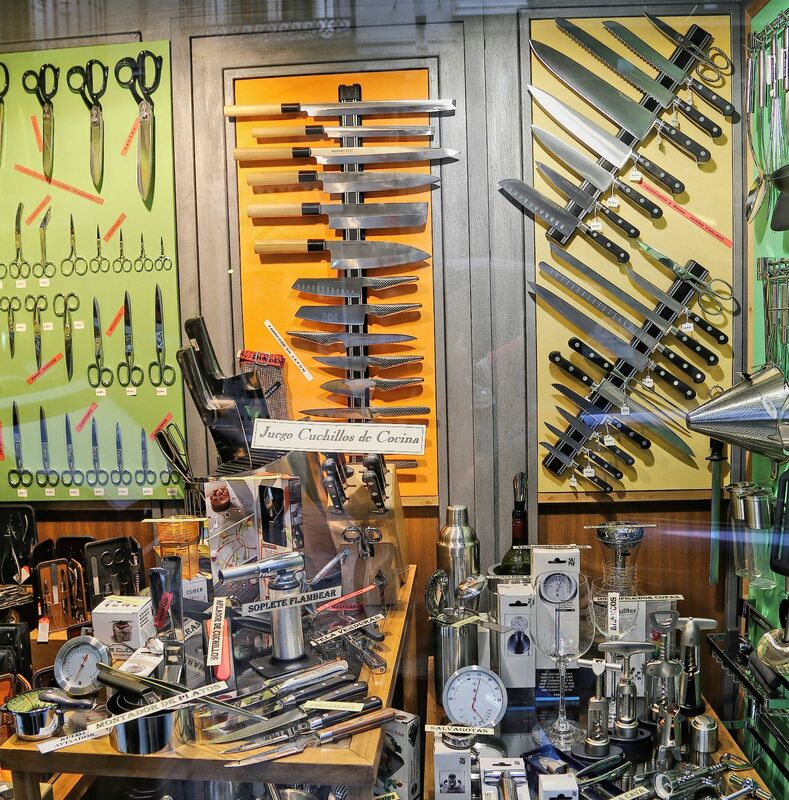 Aggressive knife peddlers are charming unsuspecting tourists with paper cutting trick. It’s here in Toledo where my best instincts started to shout loudly “tourist trap” and “ripoff”. 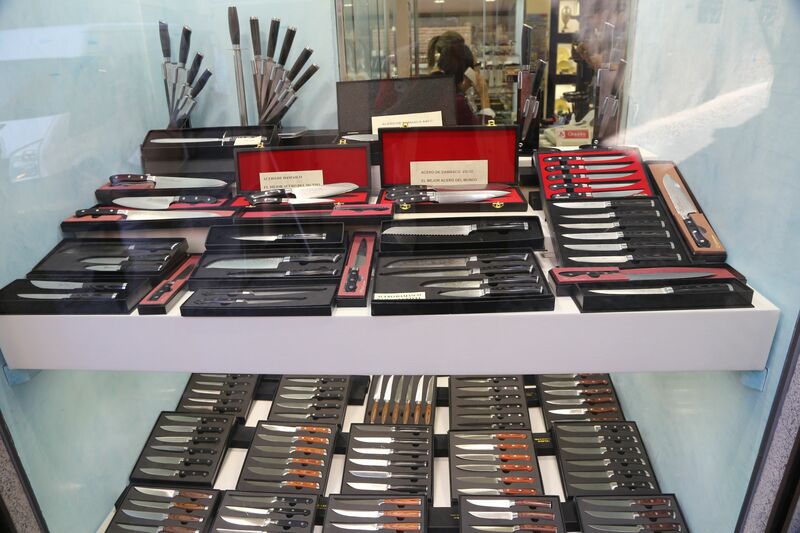 The different brands of supposedly Damascus knives offered by different shops bear striking resemblance to Chinese-made Damascus knives available at Amazon for a third of price. While some knives were marketed by eager vendors as VG-10 core knives I could not help but notice 440C mark which is considerably softer and cheaper grade of steel. 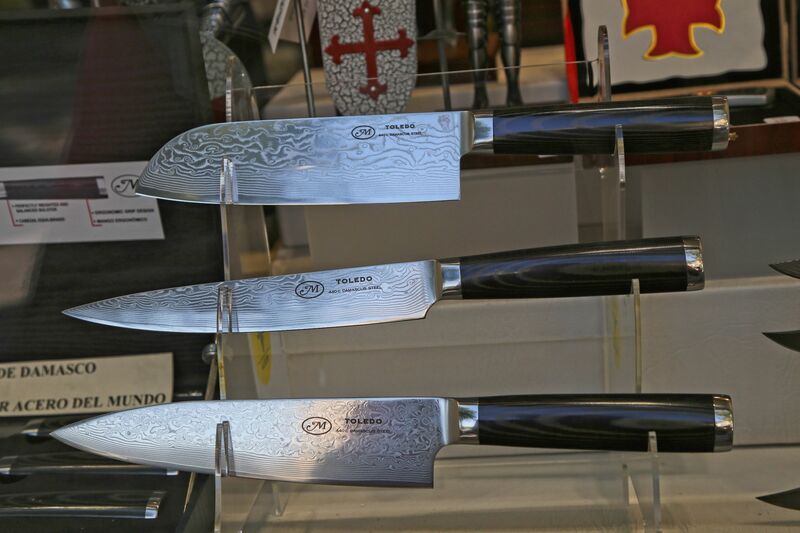 I have no doubt that thousands of tourists coming to visit Toledo are duped daily into buying worthless piece of Chinese junk for 200 euro, assuming in their naivety they bought a “unique 67-layered Damascus knife of Toledo steel”. Actually reviving glory of Toledo knives would be a great business idea, for example by launching “Toledo Knife” as a high end brand associated with quality instead of countless generic pretenders. 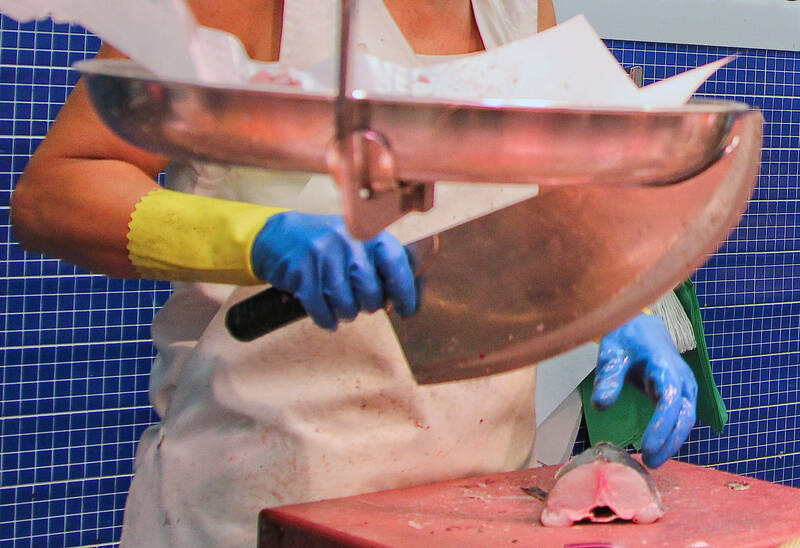 Finally the only knife I brought from Spain was the kind they use in all Spanish markets to cut fish – a very authentic wide curved heavy cleaver. I bought a Moreno Toledo knife for my kitchen while visiting Barcelona. It is the very best knife I have ever owned. I wish now I had bought more than 1! Is there anyway to purchase it here in the states or to have it shipped to me? 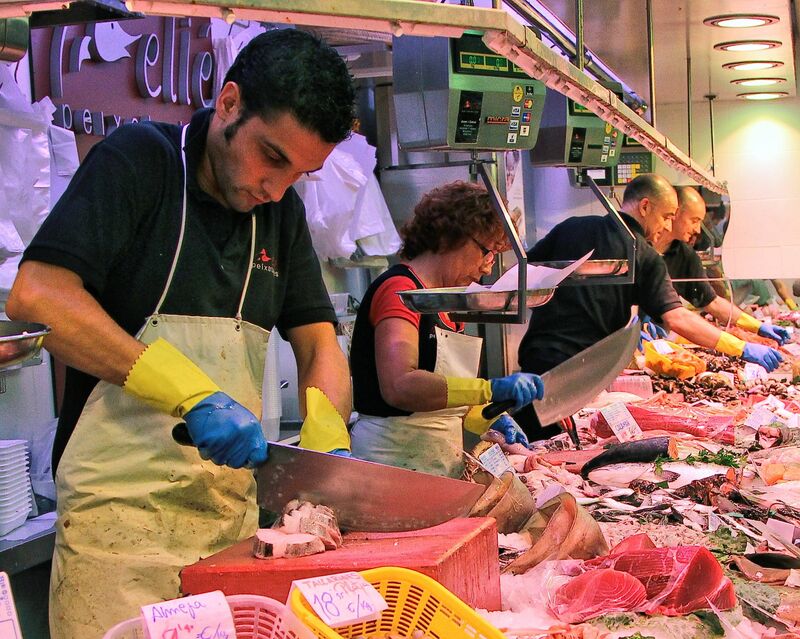 I just returned from Barcelona where I, too, became intrigued by the pescadera (fishmonger) cuchillos (knives). Nice. I used one to fillet a mackerel that was half as long as the knife and it worked very well.